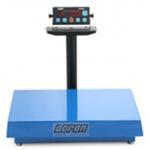 Doran’s MVP Series Scales provide the flexibility to meet your most demanding weighing tasks. Choose from the basic indicator/base configuration, or the complete stand-alone system using the optional column, wheel casters, or conveyor top. If economy, reliability and ease of use is important, you’ll be glad to have a Doran MVP Scale on your team! 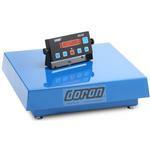 Superior accuracy is achieved through Doran’s superior design. This is where our 30 years of experience really count! Premium load cells and a rigid full-frame base construction result in phenomenal weighing performance throughout the entire capacity range. The Doran MVP series is NTEP approved and legal for trade at 5000 divisions, with models providing resolution of up to 10,000 divisions and higher for non-commercial applications. The sturdy, welded tube mild steel frame of the base is designed to withstand the use and abuse of extreme industrial applications. Seven overload stops provide outstanding load cell protection, ensuring years of trouble-free operation. The two part Polyurethane paint provides excellent wear and abrasion protection. Simple and intuitive operation with UNITS, PRINT, TARE, ZERO (On/Off) and GROSS/NET. A bright LED display provides excellent readability in a wide variety of lighting conditions and angles up to 25 feet away. 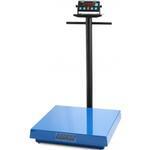 Doran’s MVP Series Scales provide the flexibility to meet your most demanding weighing tasks. Choose from the basic indicator/base configuration or the complete stand-alone system with the optional columns, wheel casters, or conveyor top. Value The MVP Series couples the DS100 Digital Weight Indicator with the DMS Mild Steel Bases, resulting in an economical scale system for most any weighing application. Select from three base sizes 18" x 18", 18" x 24", or 24" x 24", capacities up to 1000lb, a full line of options, all with a one year warranty. 18" x 18" 18" x 24" 24" x 24"